As the only telemedicine or telehealth accreditation program approved by the American Telemedicine Association, the CHQI Telemedicine Accreditation Program (TAP) seal provides consumers with an easy-to-identify confirmation of quality from an independent third-party organization – a patient and consumer benefit that had previously been unavailable for telehealth care. The program covers several types of telemedicine delivery models, including Consumer to Provider (C2P), Provider to Consumer (P2C), and Provider to Provider (P2P). TAP’s goal is to promote access to safe, quality, and competent health care regardless of the telemedicine model or modality being deployed, or the type of clinical services being provided to patients. CHQI is here to provide you with more information or answer any question you may have. We're ready to lead you into the future of accreditation. Thank you for your interest in seeking accreditation with the ClearHealth Quality Institute (CHQI). How do I apply for CHQI accreditation? The first step towards accreditation is to register and apply for qualification through our Telemedicine Accreditation Submission Portal, CHQI’s customized, HIPAA-compliant submission portal. Organizations are screened ahead of time by CHQI to determine if they qualify to apply for accreditation, and if so, for which telemedicine modules. After being deemed eligible and executing the accreditation agreement, applicants will upload application materials and supporting documentation through the Portal. CHQI staff members are available to applicants throughout the process to answer questions, troubleshoot, and to provide additional guidance and interpretive assistance about the Telemedicine Accreditation Standards and Guide. Have a question? We’re here to help. Contact us at info@chqi.com or (410) 756-1300. CHQI’s Telemedicine Accreditation Program Standards provide instructions and guidance to organizations seeking accreditation for a variety of different telemedicine clinical service lines and delivery models. 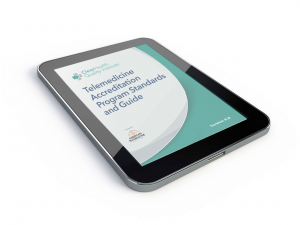 Click here to purchase the Telemedicine Accreditation Program Standards and Guide. To receive a complimentary copy of the Telemedicine Accreditation Program Standards Executive Summary, please fill out the below form. Who is eligible for the CHQI Telemedicine Accreditation Program (TAP)? What is the relationship between CHQI and the American Telemedicine Association (ATA)? In May 2017, the American Telemedicine Association (ATA) entered into a strategic partnership with CHQI to merge the ATA’s Accreditation Program for Online Patient Consultations into TAP. A primary goal of the partnership is to ensure that the accreditation program is handled by an independent third-party accreditation organization. CHQI has refined the standards and expanded the scope of the program to include all forms of telemedicine delivery and modalities.CHQI provides total program management for TAP and is responsible for all aspects of the accreditation program. CHQI is solely responsible for conducting all accreditation reviews, audits, and issuing accreditation decisions. Why seek CHQI accreditation for your organization’s telemedicine programs and services? If my organization earns the CHQI accreditation seal, how does CHQI assist my organization in announcing and promoting my accreditation? CHQI provides accredited organizations with promotion of recognition earned through the accreditation process, including directory listing on CHQI’s websites for providers and consumers. How do I apply for TAP accreditation? How do I submit my application and documentation to CHQI? Interested organizations must first register and be deemed eligible for accreditation by CHQI staff, which occurs within 5 business days of registering. After being deemed eligible and executing the accreditation agreement, Applicants will upload their materials and supporting documentation through CHQI’s customized, HIPAA-compliant submission portal. How were the standards for TAP developed? The Program Standards and Guide for TAP was developed in conjunction with leading experts in the field, based on clinical guidelines, expert consensus and laws and regulations. CHQI’s Telemedicine Standards Committee consisted of more than a dozen individuals who represented various stakeholders, including the telemedicine industry, providers, insurers, and consumers. The standards incorporate input received from numerous individuals and organizations during the public comment period, including medical societies, regulators and consumers. The standards were then revised and approved by the Telemedicine Standards Committee and the CHQI Advisory Board. The Standards Committee continues to meet to make updates to the Program Standards and Guide, and also is in the process of developing new telemedicine accreditation modules. How can I receive a copy of the TAP Standards? Once approved to apply for accreditation and payment is received, eligible organizations will receive a copy of the Telemedicine Standards and Guide. The Standards and Guide can also be purchased separately for $495. If an organization purchases the standards and decides to apply for accreditation later, the purchase price of the standards will be deducted from the application fees assessed once an organization is deemed eligible to apply. Does my organization have to comply with all Standards? An organization must document compliance with all applicable accreditation standards and related requirements. All applicants must complete the Core standards and the other relevant modules for existing telemedicine clinical service lines (use cases) to be included in the application. In some cases, a standard may not apply based on unique features of the organization’s business model and/or types and scope of clinical services. In these cases, the applicant will be expected to explain why the standard does not apply. What are the fees associated with the accreditation program? Accreditation fees are tailored to each organization based on the characteristics of the organization and the scope of review by CHQI. CHQI is committed to keeping accreditation fees reasonable. Each applicant receives a written quote when applying. There are several factors that can affect the length of time it takes for an organization to complete the accreditation process. The program is designed to be completed in as little as two (2) to three (3) months for organizations that are ready to submit all required evidence and satisfy the standards. In cases where organizations may discover gaps in policies and procedures while working on the CHQI application, the time for required vetting and approval can increase the length of time an organization may need to complete the process. Timeline requirements are clearly identified in the application materials, so there are no surprises throughout the accreditation review process. What is the length of the accreditation cycle? The accreditation is effective for two years. To renew accreditation at the end of a two-year cycle, organizations are required to submit a renewal application. Three (3) individuals are assigned to review various aspects of the application. A CHQI staff member will review the application for completeness prior to assigning an Administrative and a Clinical Specialist to substantively review the application materials and make a recommendation for accreditation to the CHQI Accreditation Committee. After the application and supporting documentation have been deemed complete, the assigned surveyors will schedule a virtual demonstration of the applicant’s clinical service lines, based on the demonstration elements required for various standards. The demonstration phase focuses on both provider and patient considerations for the applicant’s telemedicine programs and services. Is an on-site clinical visit required? Some types of telemedicine programs and services are not conducive to video- or computer-based demonstrations due to privacy concerns of patients or the nature of services being provided. If CHQI determines that an in-person, on-site clinical visit is necessary, a surveyor assigned to the application will coordinate the visit (which will typically take one day) to verify compliance with specific standards and application requirements. What happens if areas of non-compliance with any of the accreditation standards are found during the review process? As part of the accreditation review process, organizations will be notified of any deficiencies in the application and supporting documentation following the preliminary review of the application. Applicants will be afforded a reasonable period to address any deficiencies before the demonstration and/or on-site clinical visit will be scheduled. Who makes the final decision on an accreditation application? The CHQI Accreditation Committee makes all decisions on accreditation applications. The CHQI Accreditation Committee is comprised of a broad group of stakeholders, including providers, industry representatives, consumers, employers, legal experts, and others. Accreditation Committee members are vetted and appointed by the CHQI Advisory Board. All applications forwarded to the Accreditation Committee remain confidential to ensure the integrity and objectivity of the accreditation review process. What options are available to an applicant who receives an adverse decision such as denial or revocation of accreditation by the CHQI Accreditation Committee? If an Organization receives an adverse accreditation decision, CHQI staff will provide details about the appeals process at the time the applicant is informed about the decision. CHQI affords applicants receiving an adverse decision two levels of appeal, first to the CHQI Accreditation Committee and then to the CHQI Advisory Board. CHQI does not make public adverse actions by the CHQI Accreditation Committee or the results of appeals. Is my accreditation status available to the public? Yes. Once accredited, each organization will be listed on CHQI’s Online Directory of Accredited Telemedicine Organizations hosted at www.chqi.com. An accredited organization is encouraged to issue a press release announcing the accreditation determination as long as CHQI’s marketing guidelines are followed. In some cases, CHQI also might issue a press release referencing one or more accredited organizations. In addition, accredited organizations must display the official seal of the CHQI Accreditation Program on their website and use it when advertising their program. Is the data and information collected from my organization during the accreditation process kept confidential? Yes, all accreditation application information is kept confidential, unless disclosure is required by law. Does an accredited organization have any reporting requirements to CHQI? Accredited organizations are required to notify CHQI about changes, including but not limited to changes in ownership, originating and distant sites, and new clinical service lines. If an accredited organization seeks recognition of new clinical programs and services prior to the scheduled renewal of accreditation, it may submit an abbreviated application to CHQI.